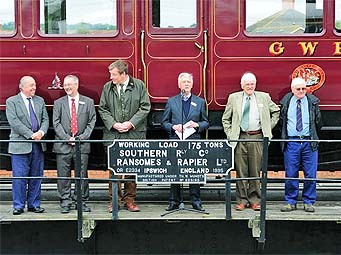 The Great Western Society is pleased to announce that it has been awarded the Heritage Railway Association Large Group Award for 2011. 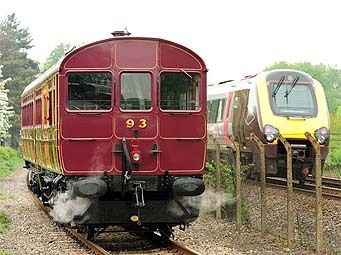 This recognises 50 years of excellence within the railway preservation movement, culminating in the restoration to working order of Steam Railmotor No. 93. As well as celebrating the HRA award, 2012 will also see No. 93 celebrating the Olympics. Although we have not been selected to carry the flame, we will still be recording the fact that No. 93 conveyed the public to the games in 1908 when they were held at ‘The Great Stadium’, now known as White City. During the period of the 1908 games No. 93 was allocated to Southall, and worked on the suburban lines from Paddington including the joint GW & Met. line to Kensington, covering a recorded 54,806 miles between March 1908 and August 1909. The photo shows an original handbill from the Society’s collection advertising the ‘Quadrennial Olympic Games’ – a rare surviving document. An example of problems with the mouldings – Lifting away from the cladding due to unstable material. Over the last couple of months or so we have become increasingly concerned with the condition of some of the exterior mouldings applied to No.93. Initial symptoms were cracking between some of the joints adjacent to the window frames, and this was followed by distortion through warping of other areas both above and below the windows. The decision was made at an early date that the degraded appearance did not meet the high standards that the Society demanded, so as soon as possible after the end of the operating season action was taken to establish what was wrong and to find a solution. Railmotor No. 70 at Swindon Works - March 1907. 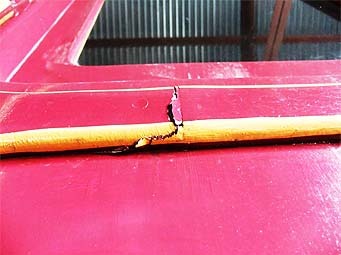 In conjunction with the vehicle restorers at Llangollen, specialist advice was sought on both the materials and method of application of the mouldings. This advice has now been received and the necessary actions are being taken to rectify the problem. 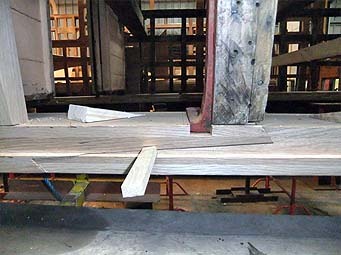 The bottom line is that the material selected and approved by the Society has proved to be unstable in this application, and as a result the decision has been made to remove all the existing mouldings and replace them with a more stable material that has been recommended by various timber associations as well as by others expert in railway coach restoration. There are no issues with the standard of workmanship, the problem is simply one of material specification. 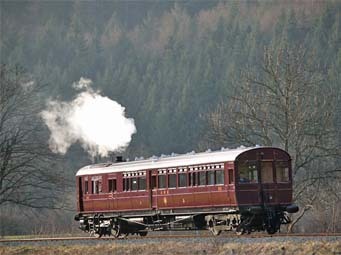 The decision has been taken in conjunction with Llangollen that the work will be undertaken in the C&W restoration bay at Didcot, rather than return the vehicle to Llangollen, so you may well see C&W staff from both locations working together on the coach. Once the repairs have been completed 93 will be repainted and relined before re-entering traffic in the Spring. Problems with mouldings are not confined to the Society’s rebuild of No. 93. 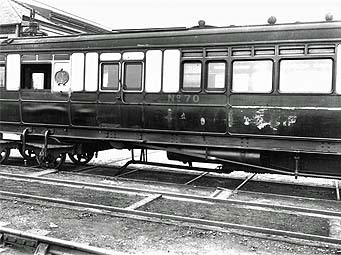 The picture of Railmotor No. 70 taken at Swindon while under repair in March 1907 shows that the GWR had problems as well, with a horizontal length of moulding missing from a side panel and also bits missing from under the water filler lid. This photo is also unusual in showing the vehicle on an accommodation bogie with the boiler and power bogie removed. 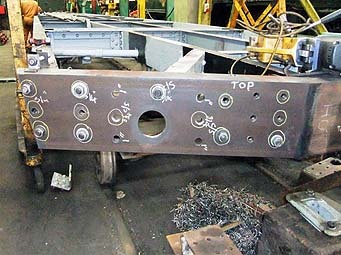 Note that the centre of this bogie is not on the same alignment as the power bogie, being set forward on support pads attached to the underframe just in front of the scroll iron position rather than centrally between the irons. Also of interest is the boiler closing plate just visible balanced on the roof above the luggage compartment doors. The remains of the gangway end after removal of cladding. Work in progress before the new cladding is attached. The last month has seen all the main construction timberwork completed except for the driving end, where we still have some material to be delivered. The last of the longitudinal rails has been fitted under the windows on the second side allowing the exterior cladding to be fitted, and work on the roof has included sanding the boards in preparation for applying the roof canvas, which has now been delivered. In addition most of the interior T&G cladding has been fitted to the passenger saloons and centre vestibule, and work has commenced on manufacturing the top light window frames. The photos show ‘before & after’ views of the gangway end of the vehicle and illustrates the amount of reconstruction required due to the poor condition (and lack of !) the original frame work. It can be seen that without temporary props the end would have completely collapsed once the cladding and doors, which were nailed shut, were removed. 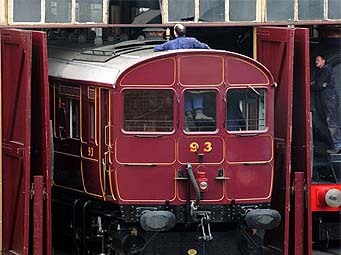 A GWR match striker of the type fitted to Number 93. Like all good projects, things never get completely finished. 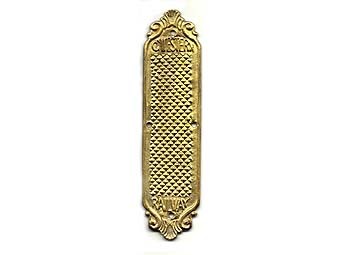 One item in the Rail Motor interior that has been missing since we declared it complete back in March were the distinctive pressed brass GWR Match Strikers that the Company fixed in the smoking saloons and compartments of coaches. For a considerable time we have lacked a suitable sample that could be used as a pattern, until one was loaned to us in the middle of the year. Having considered making a press tool, and immediately rejecting this due to the high cost, we opted to produce a small quantity for both 93 and 92 by the loss wax casting process and four have now been fixed in the Smoking Saloon of No 93, with a second batch cast to fit in No 92. There is however still an outstanding query regarding the fixing of ashtrays in c1908 vehicles – Despite raising the question over a considerable period with a considerable number of people, nobody has shown the Project photographic evidence of ashtrays being fitted, let alone the style used in smoking saloons before the first World War. Do you know? - if so please tell us. Over the last couple of months since the body and under frame were reunited, considerable progress has been made on rebuilding the vehicle body. 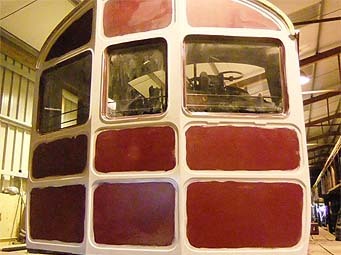 The main bottom stretcher has been completed and attached to the under frame with new coach bolts and one complete body side including new door pillars to the centre vestibule has been reconstructed and clad up to window level. Construction of the second side is well in hand, and is sufficiently advanced to allow access to the roof without danger of the whole structure collapsing. These few words fail to explain in detail how much work has been undertaken on the structure, but the photograph shows the progress made. 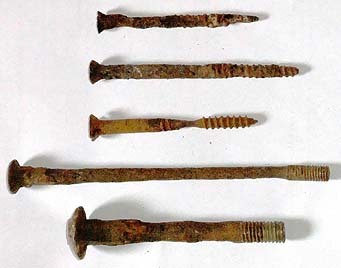 An example of some of the fastenings removed from the original framework show the original condition and why there was a need to replace them with new. Another project milestone was reached during the second week of August when the almost complete underframe of Auto Trailer 92 was propelled by the yard shunter from Llangollen's locomotive works down to the C&W workshops at Pentrefelin to be reunited with the coach body. 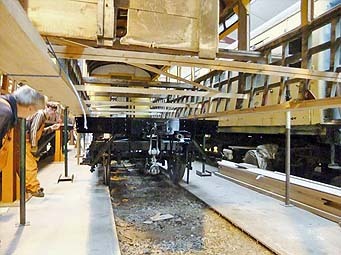 Witnessed by vehicle Project Manager, Graham Drew, and Society Chairman, Richard Croucher, and supervised by Llangollen's Dave Owen, the rolling underframe was successfully placed beneath the body enabling the structure to be lowered into place. The increased stability provided by the underframe will enable work to proceed on completing the structural woodwork and installing the floor over the next couple of months. 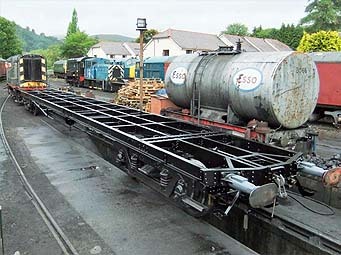 Looking smart in it's coat of black paint Trailer No 92's underframe is moved from Llangollen's Loco Works. 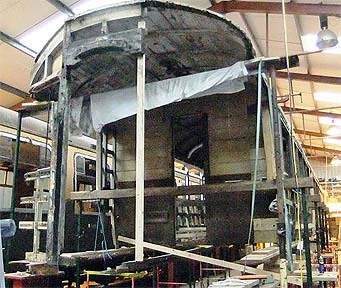 Dave Owen guides the underframe through the C&W works prior to installation under 92's body. 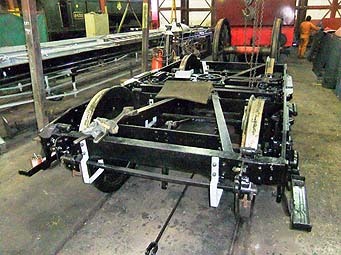 The underframe is gently eased into place beneath the coach body, which is held in place by temporary supports. 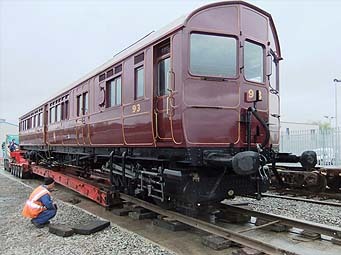 While waiting for the frames to be delivered work has also progressed on some of the interior fittings, with completion of the frames and upholstery for the bench seats, which together with the ‘walkover’ seats restored at the same time as No 93's are now ready for installation at the appropriate time. Assembly of the first pair of doors from ‘flat pack’ kits and delivery of most of the outstanding timber orders has further progressed the project. Although the body was removed from the frames over a year ago, work on SRM 93 took priority up to the point where it was completed and returned to Didcot in April. Since that time work on No 92 has proceeded at a far faster pace. Progress has been helped by the injection of additional funding by the Heritage Lottery Fund to cover the cost of restoration work not apparent when the original bid was made, and the Society acknowledges the contribution made, without which work would have been delayed. However the message is that your financial support is still required as the Society has to find the match funding, and this is by no means a small amount. With the focus of attention being directed at the completion of 93 for the first part of the year, it may have been assumed that the restoration of Trailer 92 had been forgotten, but that's far from the truth. The new buffer plank being fitted to the driving end framework. 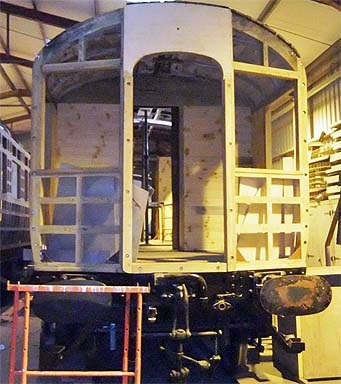 Work nearing completion on one of the bogies. Work in progress fitting the pre-machined bottom stringer to existing main structural uprights . Since 93 left the C&W workshops in February work has continued at a steady pace on the restoration of No 92's underframe in Llangollen's locomotive works. 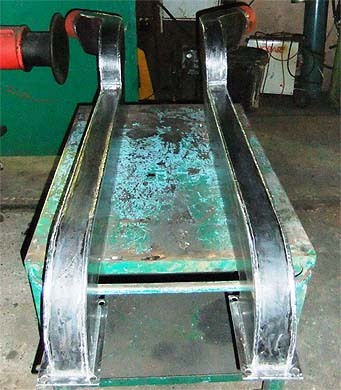 Replacement of both main buffer planks together with the first six foot or so of the main structural framework had to be undertaken due to excessive corrosion, and a problem with obtaining the correct steel section delayed this work for a period before riveting and welding could be undertaken. The buffers and draw gear have been renovated with the springs being re-tempered by our specialist contractor, and the coach bogies have received a full overhaul, again with re-tempered primary suspension springs, and in this case new secondary suspension springs, as the originals were past there use-by date. As with 93, we found that some of the secondary suspension spring retainers had fractured and these were replaced by new castings. A complete overhaul of the vacuum brake system has been undertaken, together with the hand brake mechanism and regulator control gear, which has proved easier that No 93 as most components were still with the vehicle, rather that having to be made from scratch. However we have had to manufacture new gas tanks and steam heat system as these were removed when 92 was converted to departmental use. With 93 entering service and departing for Didcot the coach building team have been able to turn their attention to commencing restoration work on the trailer body, the replacement of the complete main bottom stringer being the main priority. Unlike 93's, which was replaced on a length by length basis with each joint being cut individually, it was decided to manufacture the new stringer in one go by machining all the joints on an CNC machine off site. - This seems to have been very successful and has reduced the manufacturing and fitting time considerably. In addition a number of new main corner posts and door posts have been machined off site and these have also been installed, considerably improving the structural stability of the assembly. 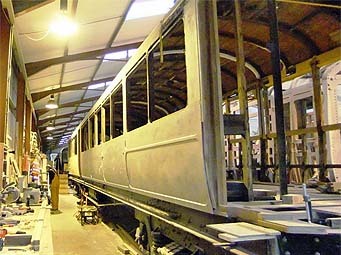 With materials being delivered over the last few months for the floor, interior partitions, exterior and interior cladding and bench seats work has been progressing up to the point where replacing the body on the underframe becomes the critical path to give a firm and stable base for further progress. A line up of self propelled units dating from 1908 to 2011. The crowd listen to Richard Croucher, the Society Chairman talking about the Project . Adrian Shooter CBE, Chairman of Chiltern Railways launches No 93 into public service. From right to left are Sam Espley, Mike Rudge, Richard Croucher, Adrian Shooter, Graham Drew and Dennis Howells . 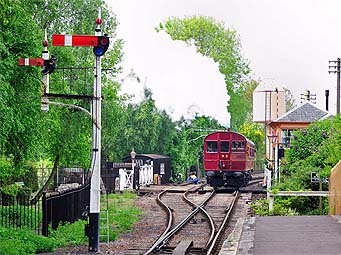 An unusual combination - The diesel & steam unit works on Didcot's main demonstration line. 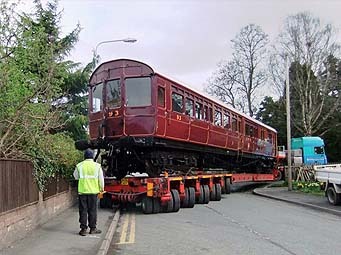 And so at last Railmotor Number 93 re-enters traffic after 76 years. 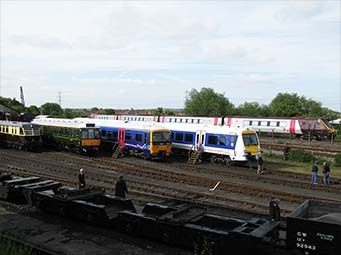 Adrian Shooter CBE, Chairman of Chiltern Railways, performed the opening ceremony before taking the controls and driving Number 93 from Didcot's turntable to the main demonstration line to commence public duties. An estimated 2,500 people visited the centre over the holiday weekend to join in the celebrations and sample the delights of Edwardian travel. As the Great Western Society always likes to do something a bit unusual a line-up of self propelled units dating from 1908 to the present day was arranged in conjunction with Chiltern Railways and First Great Western and some unusual stock combinations could be seen at various times over the weekend, the most bizarre being a DSMU ( Diesel Steam Multiple Unit) comprising No. 93 and Mk1 "bubble car" 55034 working together on the main demonstration line. It's guaranteed that this sight had never been seen before, and probably will never be seen again. With the weekend over the Units were returned to their owners, No. 93 took it place in the locomotive roster, and the Project Team turned their attention to the continuing restoration of Auto Trailer 92. 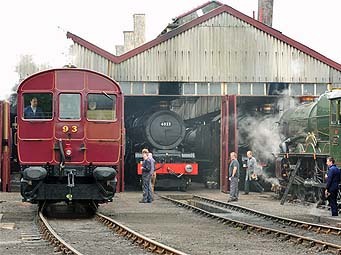 A sight that could only be seen at Didcot - two Kings, a Castle and a Railmotor ‘on shed’. The first run on 8 road - A contrast in styles 100 years apart. The first run on the Branch Line - Passing Radstock Signal box en route to the Transfer Shed. Will it fit? - No it will not. 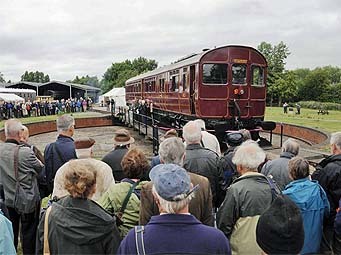 On arriving at Didcot, Number 93 was housed in its own purpose built Steam Railmotor Shed and arrangements made for public viewing through the open shed doors over the holiday weekends. The time between arriving back at Didcot at the beginning of April and the public launch at the end of May has allowed some trials and crew training to be undertaken in between the various Bank Holiday events as well as reassembly of items removed for road transport, together with final adjustments to the power bogie and boiler controls. On the day of ‘that wedding’ No. 93 was driven round the site to every location where it would be expected to go when in service (and a few places where you may not expect it to go) to check clearances and operational procedures. The lessons learnt will enable things to run smoothly when the vehicle is in service, and has ironed out a few areas where we may have run into trouble. We tested operations such as water filling, coaling and coupling procedures, as well as platform and building clearances. Lessons learnt will be incorporated in the Rule Book and various crew operating instructions. The photos show a number of ‘firsts’ achieved during the day including first trips on the Branch and 8 Road and the first attempted entry into the Engine Shed - attempted because it didn't fit, being 1/2" too high! Leaving Llangollen - ... and a tight fit at the other end. On the A5 near Montford Bridge. Unloading in Didcot's West Yard. Exactly three years and seven months after leaving Didcot, as a collection of rather soggy wood and rusty steel, SRM 93 returned to the Great Western Society at Didcot on Monday 4 April in a fully restored and working condition. Arriving at Didcot's West Yard from Llangollen at 21.00 on the Monday, off-loading was undertaken Tuesday morning and the vehicle stored in DBS's maintenance shed pending a fitness to run exam and tripping into Didcot Railway Centre on Wednesday 6. Before the forthcoming public launch on Saturday May 28 final ‘fettling’ and adjustments will be undertaken in readiness for the big day. Details of the event will be found on the Didcot Railway Centre website in due course, and we look forward to seeing you all then. 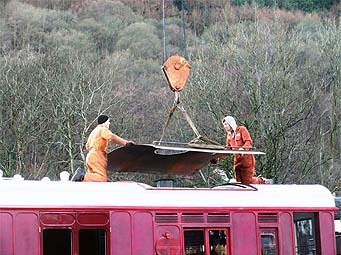 In the meantime work continues on Trailer 92 at Llangollen. Yes - we made it, though the words oil, midnight and burning do come to mind. 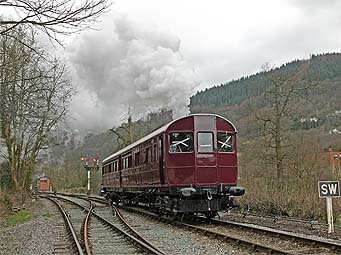 On Monday 21 March, at just about 11.10am Railmotor No.93 departed Llangollen station on a private function for the Project's supporters. 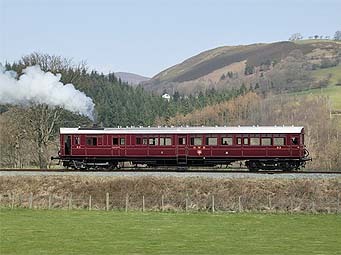 With as many who could be seated in Number 93 as possible, the Railmotor ran to Carrog, stopping at Glyndyfrdwy for a photo opportunity. Following the Railmotor was Llangollen's DMU carrying those who could not be accommodated in the Railmotor (all of whom got to travel in the Railmotor on the way back!). Once all were at Carrog a small celebration was held with the customary ‘nibbles’ and a speech by GWS Society Chairman Richard Croucher before the return journey. On the following three days organised photo charters were run in weather that could not have been better. 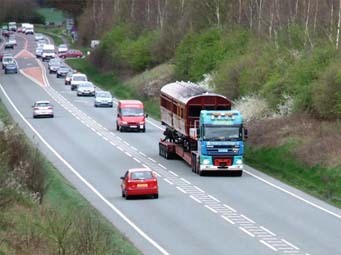 This allowed some serious running-in to be undertaken, with over 150 miles being covered. The GWS Didcot crews were able to put into practice the skills learnt in Switzerland, and apart from some minor adjustments being required to things like damper operating mechanisms to achieve satisfactory working on curves Number 93 performed in a satisfactory manner, proving to be free steaming and surprisingly fast off the mark. The photos speak for themselves. 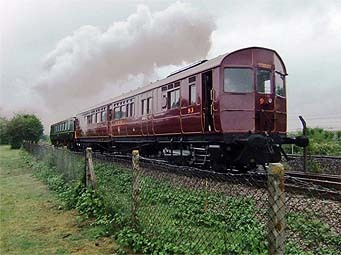 All is now set for the return to Didcot Railway Centre, and the first chance for everyone to have a ride on 28 May. On return to shed after the trial runs, work continued on the interior with the last pieces of mouldings fitted, together with roller blinds (sounds easy, but 384 screws later ...), completing the retractable step mechanisms and boiler room floor plate together with final cleaning and varnishing in the saloons, vestibules and luggage compartment. - ... compared with profiling the boiler closing plate prior to fitting. However most of the outstanding work was on the under frame and body exterior. Lamp irons, steps, handrails, destination board brackets on both ends, and brass handles, door stops, more destination boards and steps on both sides. The biggest, and some would say the most important job, has been lining out an estimated 1200 feet in gold, and painting the crests and numbers, taking two weeks hard graft to complete. The steel boiler closing plate required considerable thought and a certain amount of ‘adjustment’ before being considered satisfactory, and the boiler room sliding doors were fitted, but only after lining out as some of this is behind the door posts and could not be done in situ. Work on the underframe included completing the trailing regulator connection to the power bogie, together with the front vacuum pipe, steam heat pipes, damper and sanding linkage and adjustments to various small bore pipe work on the boiler. On return after the trials the ‘jobs to do’ list was four pages long, but hard work plus overtime and weekend working by Llangollen's staff has reduced this to under one page with a few days still to go to the point when everything must be completed. Number 93 accelerates away from Goods Junction up the bank towards Dee Bridge. After spending a couple of weeks in Llangollen's locomotive works, mid afternoon on Sunday 27th. 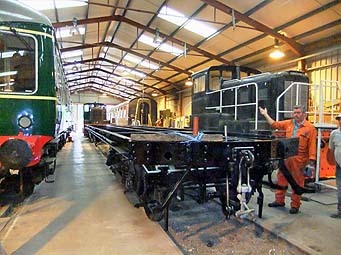 Number 93 was moved into the yard and steam was raised to prove the recently installed pipe work and systems. Although work was still continuing on the vehicle, the hour was late and it was dark and raining, we had enough confidence to drive it up and down the yard a few times and so reactivate the Engine History Card, which was stuck at November 1934 and 479,006 miles. With Vehicle Project Manager Graham Drew on the regulator, and Didcot footplate crew John Minchin and Mark Baldry in attendance about a quarter mile was added to this total - not much, but a significant milestone for the Project. 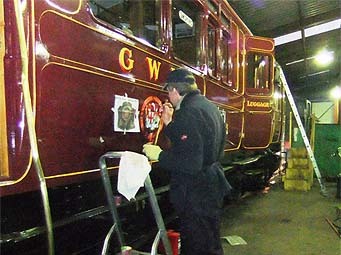 The following morning Sunday 28th most of the minor leaks and adjustments that you always get with a new vehicle were attended to, and with Power Bogie Manager Dennis Howells together with the Society's pressure vessel insurance inspector on site the final signing off of the boiler was undertaken. 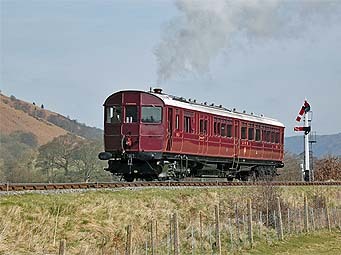 Having the ability to both move and (more importantly) stop, the decision was taken to "go for it" and at 14.10 Graham Drew eased the Railmotor through the yard down to Goods Junction and out onto the main line where a number of trips were undertaken between Llangollen station and just beyond Dee Bridge, progressively working up to line speed with each trip. 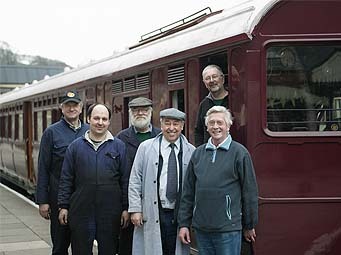 Carrying Society Chairman Richard Croucher and most of Llangollen's workforce that have been involved in the project as passengers, the opportunity was taken to combine the running in with crew training. With Peter Jennings as well as Dennis Howells in attendance, all were able to take turns on the regulator and shovel as well as keeping an eye on bearing temperatures and water consumption. Firing was an experience, with the small fire hole set low down that tended to be not in exactly in the same position all the time proving difficult to aim at with constant accuracy. - a smaller shovel should solve that problem. Likewise it was at first a little disconcerting when driving to have the controls move about, but all agreed that the bark from the chimney when climbing up the bank towards Dee Bridge at line speed was a very satisfying sound. With a reasonable number of miles for a first running-in trip under our belt and early evening approaching, number 93 was returned to shed and disposal undertaken to enable the finishing touches like exterior fittings and lining out to be completed over the next couple of weeks. After a long hard day the team, with a great deal of satisfaction, set off for home. The Rail Motor en route to the Loco Works. On the morning of the Tuesday 8 February Number 93 was shunted by Llangollen's Class 08 from the C&W works at Pentrefelin Yard up to the Railway's locomotive works to enable the various pipe systems that connect the power bogie and boiler to the coach under frame to be installed. Trial fit of the boiler closing plate. 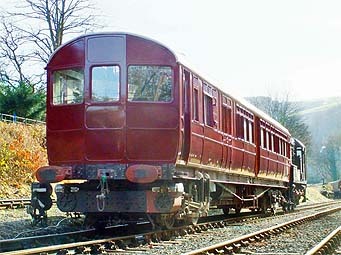 The vehicle is seen standing in the loop at Llangollen Goods Junction en route to the shed with the first of several coats of Crimson Lake topcoat applied to the body, but still requiring work on the under frame and bogie together with the attachment of external fittings. Later that same afternoon a trial fit of the steel boiler closing plate was undertaken before the vehicle was propelled into the shed. The "shocking pink" colour is a result of cutting back the last of the undercoats before applying the gloss finish, and yes H&S was observed, although not apparent in the photo. Mouldings - Work in progress on fitting the mouldings to the vehicle boiler end. 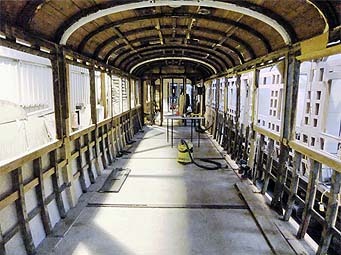 December and January has seen rapid progress on the Railmotor body exterior mouldings with additional labour being employed to progress this work. The task has proved to be extremely labour intensive as each individual piece of moulding has to be hand profiled before fitting due to minor variations in the original 1908 body construction. After fitting each piece has been filled, sanded, and had five coats of paint applied before being passed as satisfactory. To give an idea of the work involved, the photo of the boiler end shows over seventy individual pieces of moulding fitted to the cladding. Water filler pipes - The two fabricated filler pipes that will connect the side inlet to the water tank. The strange shape is to allow the pipes to clear the power bogie under the frames. The completion of the side mouldings has allowed roof gutters to be fitted, and at the same time rain strips and the base steelwork for the boiler closing plate have been installed. 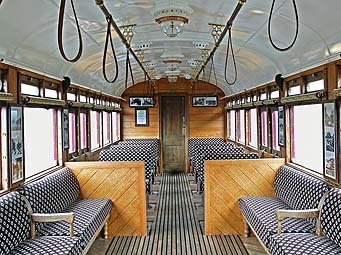 The completed roof interior in the large passenger saloon. 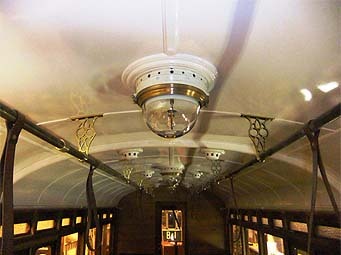 Work on the passenger saloons, Driver's vestibule and boiler compartment has seen many of the fittings put in place including the gas lamp globes, passenger communication gear, pictures and signs, while the final set of doors for the luggage compartment have also been hung, allowing the drop lights and fittings to be installed. 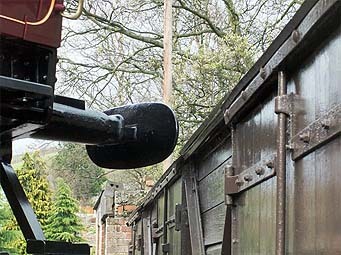 The coal bunker and boiler end handbrake have also been secured in place, together with the trailing end brake and sanding gear operating mechanism. Up in the Loco Works the water pipe work to connect the above sole-plate lengths to the under slung tank have been fabricated ready for fitting, together with the steel corner and side steps.